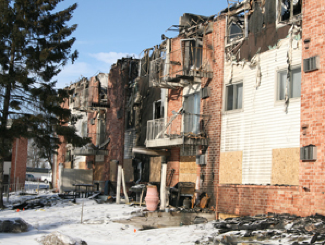 Almost every fire loss is also a water loss due to the extinguishing process. ICC is a mitigation focused, full service contractor that strives to get you back to normal as quickly as possible with as little reconstruction and replacement as possible. 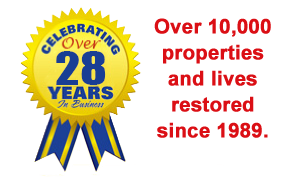 Calling upon our 20 years of experience, ICC will work diligently to get your property back to pre-loss condition and get your life back to the way it was before this occurred. Keep your hands clean and limit movement in the structure to prevent the spread of soot particles to carpet, upholstery, walls and woodwork. Change the filter in your heating and air conditioning system and don’t turn it on again until it can be inspected by a professional. Tape a double layer of cheesecloth over air registers so soot will not get in or out of the duct system. Never consume any food or beverages that were in the damaged area, as they may be contaminated. Avoid turning on any ceiling fixtures in the affected rooms, especially if ceilings and walls are noticeably wet from the extinguishing process. Wires may be wet or damaged and cause electrical shock. Air movement from ceiling fans can also create secondary damage. Do not attempt to clean anything in the affected areas without contacting ICC first. This goes for walls, carpet and flooring, furniture and any appliances and electronics. Additionally, clothing and garments should not be sent to a dry cleaner without having an expert like ICC inspect the damage. Improper cleaning can set damage or ruin items.